New. They are so cute but never wore them. ADIDAS SAMBA WOMEN'S soccer shoe sz 7 indoor soccer blue suede. Shipped with USPS Priority Mail. Women's Adidas Sambarose Platform Shoes Size 7 Black Brand New In Box! 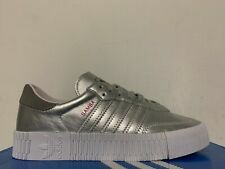 Women's Adidas Sambarose Platform Shoes Size 7 Brand New In Box with tags! Awesome shoes! See pictures. Good Luck! Women's Adidas Samba Sneaker Soccer Training Shoe BD7686 Size 6. Condition is Pre-owned. Shipped with USPS Priority Mail. These shoes run a WHOLE SIZE SMALLER! Condition: Pre Owned. Style: Casual. Adidas Samba Women’s Trainers Lace Up Shoes Black Leather Size 6 BZ0620 M17. Condition is Pre-owned. Shipped with USPS Priority Mail. Adidas Samba Rose Black Gym Leather Platform Shoes Women's Sz 7.5 B28157 NEW!!! Brand: Adidas Size: Women's US 7.5 Color: Black/Gum Condition: Brand new without box Description: Adidas Samba Rose Platform Shoes Terms & Conditions: All sales are final. Shipping: $10 with free tracking number within US. International Standard Shipping $40. "Samba" is imported. Adidas leather and suede low-top sneaker. Ribbed heel counter. Gum rubber outsole. 1" flat heel. New with box— Women’s Adidas Originals Samba Rose Platform Sneakers in a size 5.5. Green leather with classic stripes. Bought new at Adidas for $100. Adidas shoe sizes run big. I wear a size 6 and these are a little too big. SAMBAROSE SHOES. These sneakers rework the Samba's classic soccer silhouette as a stylish platform shoe. The leather upper is stacked on top of a raised gum rubber outsole to add height. Leather 3-stripes; Gold-foil Tongue Logo And Samba Logo On Quarter Panel. These Retro Soccer Shoes Were First Famous For Turf Training. Synthetic Leather Heel Patch. Age: Adult. Color: Black. Product Details. The material is a little dirty. Everything is 100% Authentic as always. NEW NIB ADIDAS ORIGINALS SAMBAROSE ICE PINK GUM SNAKE-EMBOSSED SUEDE PLATFORM 8. Condition is New with box. Shipped with USPS Priority Mail. Purchased from adidas online. Fit true to size and the suede is super soft and comfortable. No pets in the house, no smokers. Adidas Original Samba Rose Shoes. These sneakers rework the Samba's classic soccer silhouette as a stylish platform shoe. The leather upper is stacked on top of a raised gum rubber outsole to add height. ADIDAS SAMBAROSE W D98196 Rose SHOES Size 10.5 Pink / Shock Pink / Purple. Shipped with USPS Priority Mail. The SAMBAROSE shoes take the Samba's classic soccer look to new heights. A platform sole puts a trendy spin on this sporty silhouette. The leather upper is covered in chunky glitter for a glamorous, eye-catching look. Heritage-inspired details like a Trefoil and 3-Stripes keep them authentically adidas. There is minimal wear on the inside of shoes, otherwise they feel like new. SAMBA SHOES. Semi-translucent gum rubber is used for the low-profile outsole. AN AUTHENTIC SAMBA MADE FROM PREMIUM MODERN MATERIALS. Samba logo on quarter panel. adidas Originals. Product color: Ash Green/Crystal White/Linen. The leather upper and nubuck overlays recreate a retro feel. Gold-foil "Samba" logo on quarter. adidas Originals. runs 1/2 size big. fits like an 8 . Synthetic leather heel patch. A: Often, our answer is "Sorry, that was our last one!". The leather upper and nubuck overlays recreate a retro feel. Gold-foil "Samba" logo on quarter. adidas Originals. runs 1/2 size big. Synthetic leather heel patch. A: Often, our answer is "Sorry, that was our last one!". SIZE 5 1/2. GREAT CONDITION. 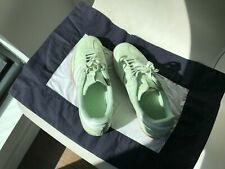 Adidas x J Crew Grey Samba size 10. Listed as size 10, but these run large. I wore them once and they were too big, but I couldn’t return them. They are in perfect condition. Shipped with USPS Priority Mail. Tech Green. - New in Box. Brand New In Box adidas Samba Women's Sneaker Size 8.5. Condition is New with box. Shipped with USPS Priority Mail. Adidas Consortium Samba x Naked BB1144 Panton. We only carry 100% authentic products, we hates fakes and counterfeits.